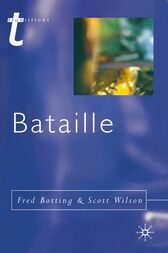 Bataille is the first book of its kind to offer lucid, diverse and relevant examples of ways of reading literary and cultural texts in the light of Bataille's work. The chapters explore the significance of Bataillean notions like heterology, general economy, transgression and eroticism through detailed readings of Shakespeare and early modern literature, Gothic and postmodernist fiction and popular movies. Bataillean concepts are situated in relation to the ideas of renowned critical and cultural theorists like Lacan, Derrida, Kristeva, Baudrillard and Deleuze, among others. Here the influence of Bataille is outlined in intellectual and historical terms, and the significance of his work can be seen for both contemporary and futural modes of cultural analysis. FRED BOTTING is Professor of English at Keele University. SCOTT WILSON is Director for the Institute for Cultural Research at Lancaster University.